July | 2011 | eat. drink. cook. travel. Quite a few friends highly recommend this place, so we thought to take my parents her to see what the fuss is all about. We ordered most of the stuff that friends recommended (thank goodness for facebook!) and had a look round the other tables for ideas too. The food came pretty fast, but the mosquitoes in the open air area got to us faster! Bring mosquito repellent if you do go. 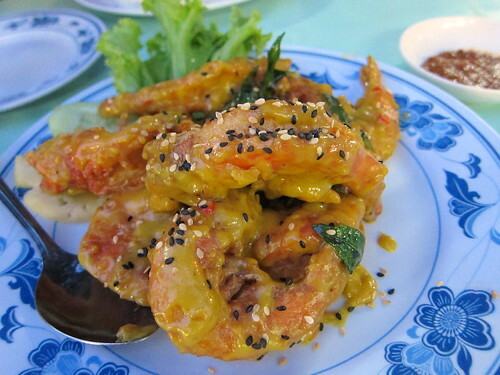 The first dish was the pumpkin prawn, an interesting take on the now-typical salted egg prawn. The prawns were first deep-fried in a light batter, then slathered with a thick savoury pumpkin sauce, full of curry leaf and some salted egg. With fresh, plump prawns, and a great sauce, it was hard to go wrong. If eaten early on, the prawn is crispy enough to be eaten whole, shell and all. 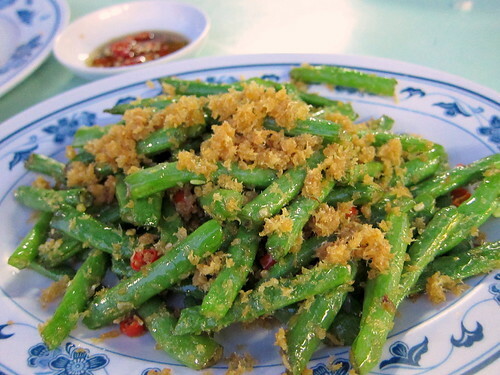 We saw other tables happily eating the long beans fried with dried shrimp (hae bee) and followed their good example. The beans were done with a deft touch, still crunchy and going incredibly well with the salty, fishy dried shrimp. Salted egg crab came next, again done very well. It was first deep-fried and then coated in a dry salted egg sauce. 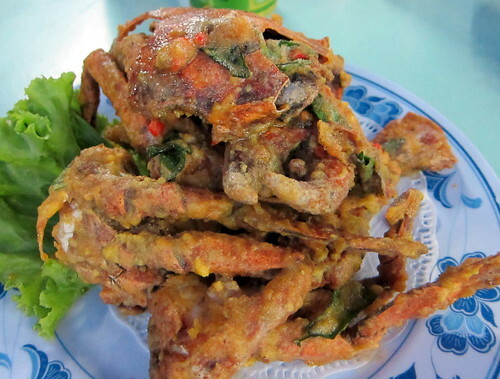 Some bits of the crab were fried so well that you could chomp bits of it down, delicious shell and all. I licked up all the salted egg sauce and the sweet, fresh crab meat inside the shell. We couldn’t help but also order the pork trotters. 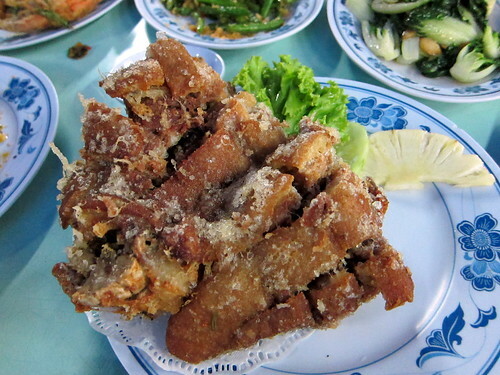 My dad liked it so much that he whacked most of it, leaving the rest of us to quickly take whatever bits we could before he finished off the crispy outside, tender inside pork. The sour chilli sauce cut through the richness, making us hanker for more. A reasonably priced zichar place that does deep-fried food very well. Watch out for the mosquitoes though. My uncle took us to Guan Hoe Soon, apparently a venerable institution of Peranakan food. I didn’t have the best memories of them at my last visit there many years ago, but this time, Guan Hoe Soon redeemed itself with excellent renditions of sambal prawns ($12), beef rendang ($12) and sambal timun (complimentary starter). The prawns were fresh and sweet, and the sambal was topnotch, flavourful and well-balanced so that it was hard to tell exactly what went into the sauce. The beef rendang was tender, a rarity for this dish, and again with very well-balanced flavours. I liked also how they did the sambal timun so simply and well, because a lot of places take the attitude that free starters are a take-it-or-leave-it affair. The ngoh hiang ($10) and sambal kangkong ($10) were decent, but nothing special to travel for. The ayam buah keluak ($12) was a disappointment, partly because they mixed the buah keluak with meat but mainly because the sauce was rather anaemic. Other than that, the desserts were decent. Most order the cendol ($3.50), which the others reported to be good. 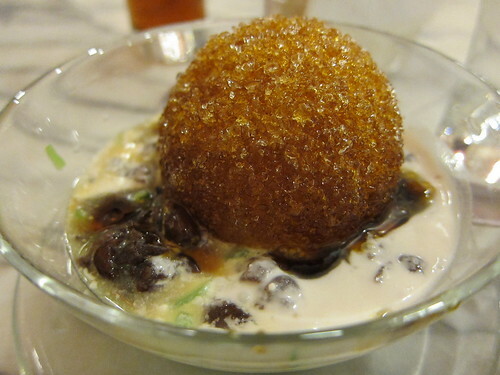 I had the sago gula melaka ($3.50), which was, again, decent but not worth going back for. 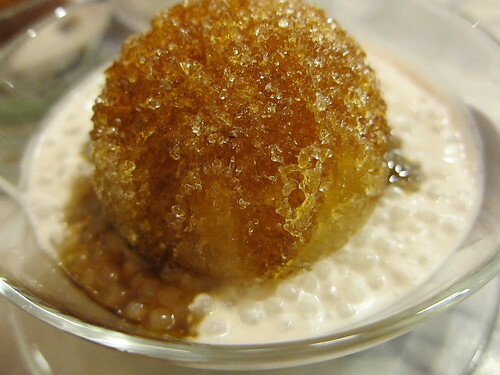 I wasn’t sure about the ice ball because it took way too long to chip through and tended to freeze the sago to unappetisingly hard little blobs. Otherwise, the gula melaka was nice and thick and I think the coconut milk freshly squeezed. 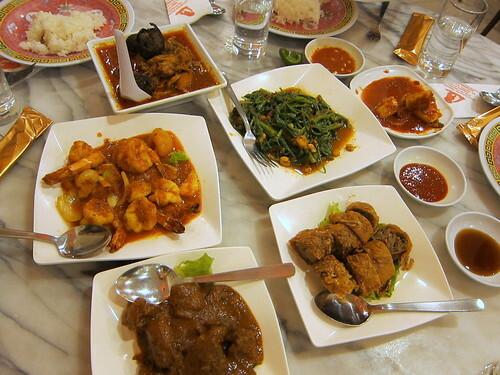 Come here if you’re in the East, on a budget, and have a craving for Peranakan food. DC and I had a special occasion to celebrate and celebrate we did! We dressed up and went to Morton’s for a blow out meal. 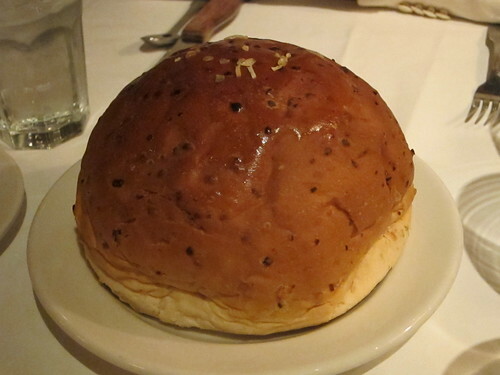 The onion bread that started our dinner was an omen of things to come – see how huge it is? We only nibbled a bit of the soft bread while waiting for the typical show and tell that the menu was about. 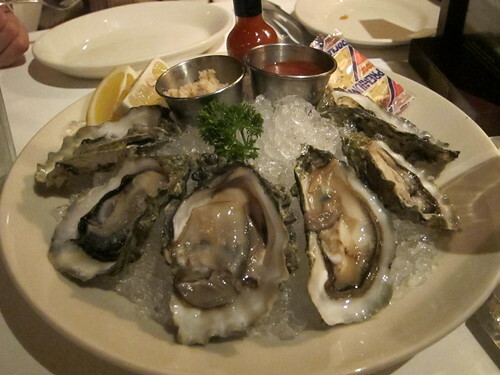 Already being forewarned that we would eat until we couldn’t eat no more, we shared half a dozen fresh Pacific oysters ($36.50) to start. They were fresh and sweetly briney, going very well with just a squeeze of lemon juice and less well with the cocktail sauce and grated horseradish. The saltines – crackers in cellophane packets – were an inexplicable, yet totally American addition to the appetisers. Then came the mains. DC was rather restrained (!) 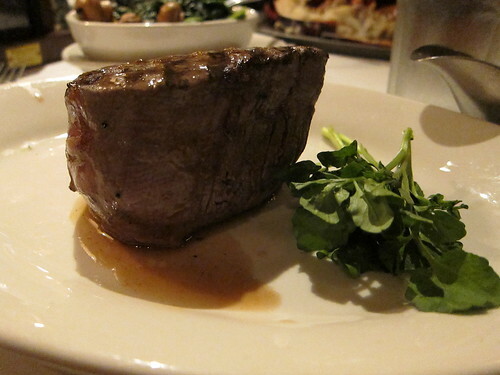 and went for a 400g double cut filet mignon ($97). Sorry for the poor lighting in the picture, but look at how high the steak is. It was done nice and rare. While a very tender cut, it wasn’t the tastiest I’ve had. Perhaps in aging the meat, all the blood is drained out and a lot of the taste is gone. Either that, or my main stole the show. When the server showed us the live Maine lobster ($50 per lb) in the menu demonstration, I knew that I was destined to have it. It was 3.5 lbs and was baked in butter. They even gave me a bib so that I could get cracking! This was lobster like I’ve never had before. 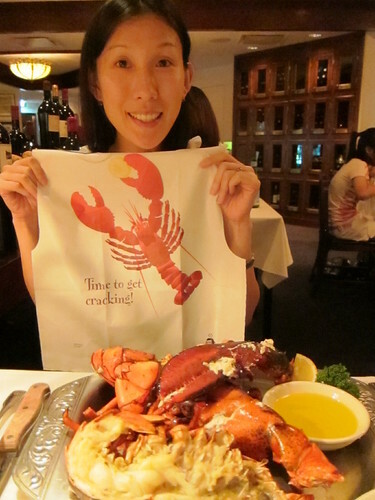 I never really understand why people like lobster so much, because I’m such a fan of the tender, sweet flavour of crab. This lobster was incredibly sweet, tasting of the sea. It was firm and full of flavour, needing only a dab of melted butter at first, then a squeeze of lemon as the richness of lobster and butter began to sate. The head bits were the richest parts of the lobster, and the best part was that it could be eaten with a spoon. The lobster was amazing, huge and way too much for me. I gave up after eating half the lobster tail and a chalky tasting claw (weakest link). DC had to help with the rest so that I could have room for dessert. 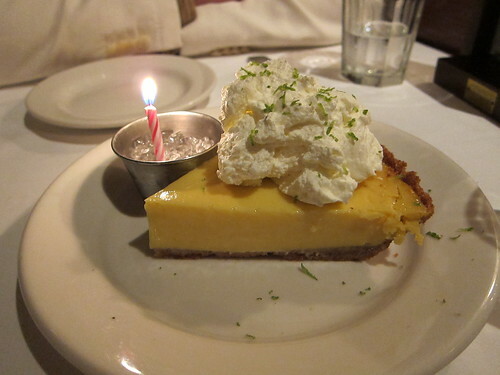 We finished off the meal with a slice of key lime pie, compliments of the restaurant. The custard part was tart and incredibly sweet, for once the cream was an absolute must so as to cut through the sweetness of the filling. It was a fitting end to our calorie-laden and very American dinner. At Morton’s, the service is impeccable. People come here for celebrations and the staff do their best to make everyone feel like it’s a special treat. In fact, it seemed that half the restaurant was celebrating birthdays. For us, the staff went all out to make sure we were OK (three different staff, from the manager to our own server asked if the food was fine and that we were having a good time) and even printed out a menu with our names and a congratulatory message on it as a souvenir. As an overall experience, Morton’s, while terribly expensive, is worth the while, simply because you and the food are the stars for the night. Bunker is a restaurant tucked in a little known corner in Changi. It’s right next to Johore Battery (whut? I hear you say), just beyond Changi prison complex and directly opposite Selarang Camp. For the history buffs out there, the Johore Battery was the only 15-inch gun battery that was not able to swivel round to fire on the Japanese troops arriving from the north. I guess the Sultan of Johore didn’t like the idea of the guns that he was paying for being able to turn in his direction. Rather incongruously, Bunker features a very nice chill-out open-air bar and an indoor fine dining restaurant that serves decent western food. Unsurprisingly, given the location, Bunker has a monopoly on fine dining options in this part of Singapore and the place was quite full even though we were visiting on a weekday. 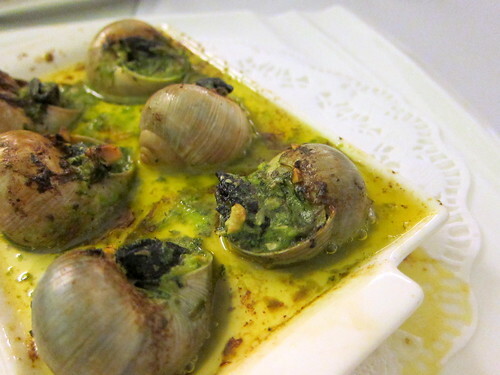 The first course we tried was the rather ubiquitous escargot, which was alright but nothing special. DC didn’t think the hazelnuts stuffed into the escargot shell added that much to the flavour. I don’t like the escargot because of the car tyre texture, and this didn’t change my perception. 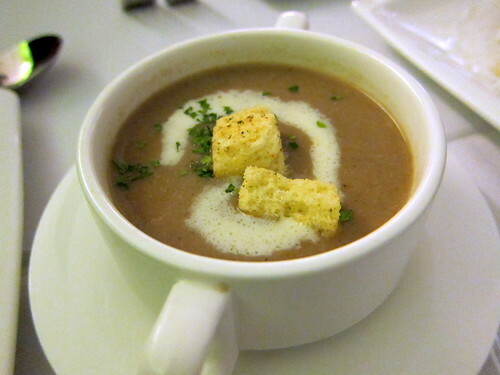 Next up was a field mushroom soup, which I thought was good because of the clear, strong mushroom flavour. Then again, I’m a sucker for mushroom soup because DC didn’t find it very special. 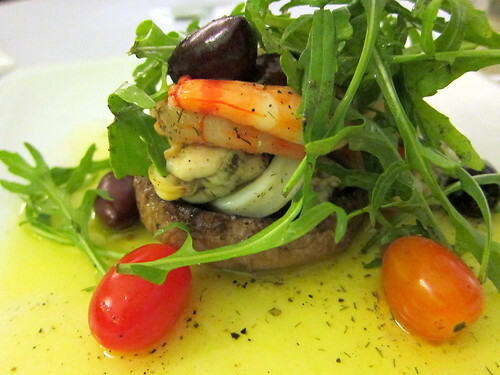 The seafood salad was a bit better, as it had nice large prawns in it. However there was a tad too much oil drizzled over the salad which had the effect of drowning any other flavour the dressing may have had. 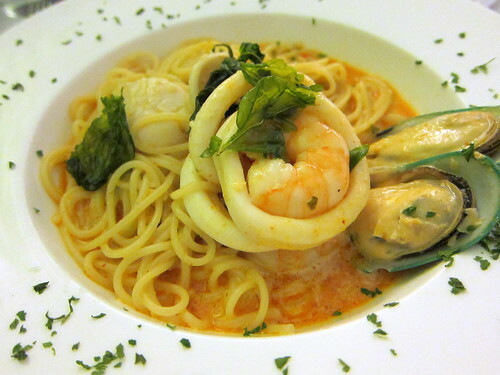 For the main course, we had the Asian-style seafood spaghetti, which was actually spaghetti in some sort of laksa-tom yam concoction.DC liked this a lot. I guess it was like laksa, but had a bite of sourness to it mixed in with the creamy texture to create a slightly unusual taste profile. You’ll notice we were very restrained in our ordering this time. I guess we were on a diet! Bunker is a good idea, especially for people who are stuck out in the Changi village side of Singapore and are looking for a finer dining option. The open-air bar is really lovely and you should try to get one of the private gazebos for a really romantic dining experience. Bunker also offers interesting and decently-priced weekday set lunches that offer a decent alternative to the usual local fare around the area. Do take the opportunity to check out this place one day and chill out among the remnants of Singapore’s WWII history!